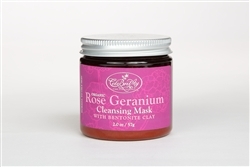 Rose Geranium cleansing mask gently cleans & exfoliates the skin while improving the skin’s circulation. Rose Clay – gently removes dead skin cells, improves circulation to the skin, and removes dirt from the pores resulting in a smoother healthier glowing skin. Ingredients: Kaolinite (Rose Clay), White China (Kaolin) Clay, & Sea Clay.